I believe that the taste of wine is most appealing and appreciated when the intimate relationship between the land, food, and wine is understood and revered. Situated on rolling hills with picturesque views of the nearby Blue Ridge Mountains, Barboursville Estate, founded by the Italian Zonin family, embraces this relationship. Currently the home of well-known Barboursville Vineyards, the estate also includes the impressive Palladio restaurant, replete with its own culinary gardens. The restaurant is simply lovely. 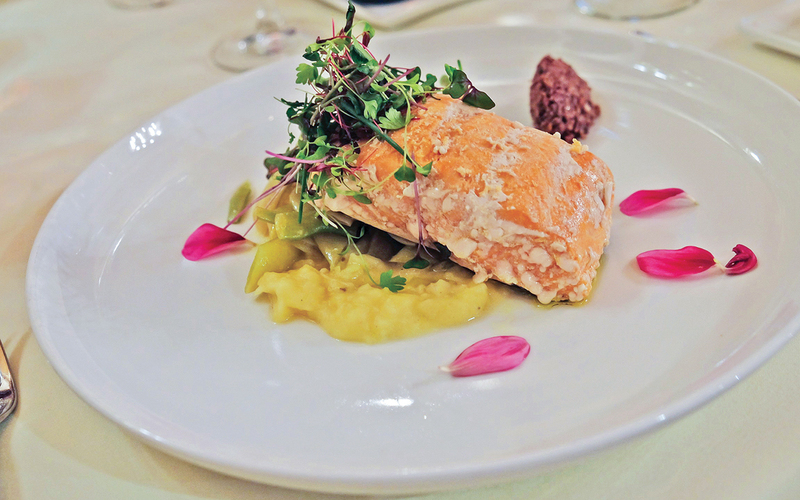 To eat at Palladio is to taste a bit of Italy and a bit of Virginia. There couldn’t be a more perfect pairing than the experience of Italian cuisine blending with the Virginia Piedmont—it’s a marriage made in heaven. And the food, which commands serious attention, reflects this ideal. Upon arrival to the estate, my traveling partner and I were handsomely welcomed and then quickly swept away to a private garden and on a grounds tour lead by Robert Sacilotto, head gardener and distinguished horticulturist. He concentrates on edible plants that can be perfected in his garden—plants that are given as much care and attention as the vineyard’s grapes—and accentuate Palladio’s menu, to then be complemented by their world-class wines. Robert was excited to share his ideas, thoughts, and work with us. He talked about his zeal for passion flowers, specifically the fruity maypop passion flower, and how he’s working to improve their size and quality. 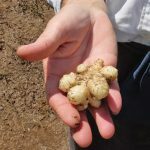 He also showed enthusiasm for the Native American potato (Apios americana), a perennial groundnut vine that bears tiny beans and tubers which have a flavor similar to cowpeas. Since our next stop was the dining room at Palladio, I found myself eager to see what prized plants of Robert’s would garnish our plates. As both a chef and gardener, I reveled in this opportunity to listen and talk of gardening and food. It melded into a symphony of conversation and helped draw my imagination into the plant world. As we moved around and through the gardens, I could sense the differing aromas of the soil and recognized that Robert’s farming practices are based on sustaining the terrain. I could also pick up on the fact that he is an experienced and talented cook. After our garden tour and back at the winery, Luca Paschina introduced himself. Since 1990, Luca has maintained the title of winemaker and general manager. He is recognized worldwide in the wine industry as a first-class wine master. A recipient of outstanding awards and recognitions, he played an enormous part in positioning Virginia on the fine-wine map, sculpting an impeccable wine culture. With his impressive list of accolades, he wears humility well. A natural leader who seems to genuinely deflect attention, he doesn’t boast about his global recognitions. I sensed he views happiness as a journey, and that he is quite conscientious—all remarkable characteristics to own. And just as the gardener and the chef have perfected bringing together delicious and thoughtful food, so has Luca perfected the wine. He can be credited, literally, with transforming this historic estate into Virginia’s most honored and recognized winery. Barboursville occupies 900 stately acres with roughly 186 acres in vine, produces approximately 38,000 cases per vintage per year, and continues to grow while maintaining its status as a world-class producer of fine wines. When tasting all the wines Barboursville has to offer, you will discover the distinctively vibrant flavors that echo the winery’s nature-filled surroundings, a beautiful expression of their original grapes remaining true to their characteristics. In 1998, he was inspired to unite Barboursville wines with Virginia’s finest food, and so was born. It was time for us to eat, so Luca joined us for a leisurely lunch—a three-hour lunch, to be exact. It seems there’s always so much to talk about when the subject matter revolves around food and wine. We engaged in conversations concerning acidic soil, mushrooms, native pollinators, harvesting wine, Thomas Jefferson and Governor James Barbour’s associations, milkweed, blue corn, and fresh homemade pasta, just to name a few. All the while, we fine-dined. As each plate arrived I made sure to focus on the subtle components that embrace the essence of a dish: the seasonality, regionality, aroma, flavor, and taste as well as the heart, mind, and spirit. We selected from the well-composed, seasonal lunch menu. 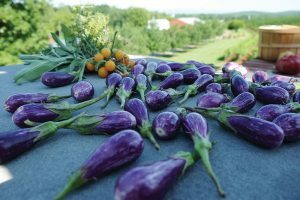 It was clear that the menu design was based on the land; many of Robert’s carefully cultivated edibles were present: the estate’s piquant variety of vegetables, fruits, herbs, and flora. It’s obvious that the wines are an important component to the menu, and Palladio curates the entire dining experience meticulously to create a polished pleasure for all the senses. The bread arrived and warmly welcomed us with a tasting of three soft house-made loaves adorned with the creamiest, most heavenly butter (though, honestly, the bread alone was so divine it could stand on its own). Top Left: First course: Vegetable salad with blanched Venice yellow pole beans and house-grown tarragon and basil vinaigrette. Top right: Second course: homemade fettuccine layered with zephyr summer squash and roasted Fairy Tale eggplants. Bottom left: Second course: roasted Fairy Tale eggplants, tomatoes, red peppers, and onions baked with homemade corn polenta. Bottom right: Dessert: lemon and traditional cocoa tiramisu. For the first course, we all agreed on the vegetable salad as we were excited to taste Robert’s prized and unique plants on the menu. The dish tendered Venice yellow pole beans, which had been briefly blanched to retain their expectedly good, crisp crunch and then cut on the diagonal. The herb vinaigrette included house-grown tarragon and basil, and was balanced and delightfully tame on the tongue. Another must-mention is the house-made smoked prosciutto. No exaggeration here when I say that it is so tender that it almost completely melted in my mouth! The kitchen also produces several other sausages and patés. The crowning dish that came out of the kitchen, in my opinion, was my choice for the second course: homemade fettuccine, lusciously layered with warm zephyr summer squash and roasted Fairy Tale eggplants, then garnished with a noticeable early-morning harvest from the chef’s herb garden. All together, the dish was imaginatively conceived and impressively executed. My friend immensely enjoyed her second course, a vegetarian dish featuring more of those delightful Fairy Tale eggplants with tomatoes, red peppers, and onions, all roasted and baked together with homemade corn polenta. Delicious and cleverly plated, you couldn’t ignore this dish even if you tried. And to think my friend shared merely one bite with me. Just as tasty was the dessert. We surrendered to locally farmed fresh peaches that were sautéed in vanilla and brown butter and accompanied by other seasonal fruits. A duet of tiramisus—lemon and the irresistible classic cocoa—also charmed our palates. All was complemented by the brightly refreshing Barboursville Phileo wine, and then finished with Italian espresso. 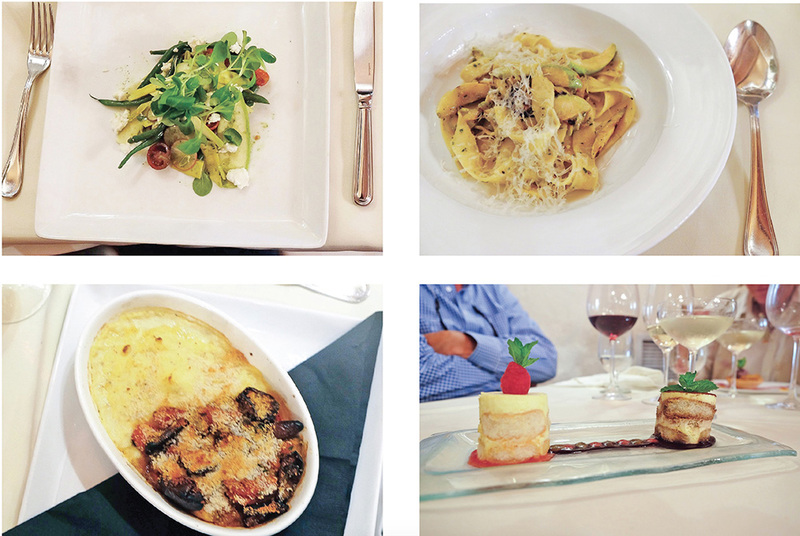 It was such an elegant finish to the entire Italian- and Piedmont-infused experience. After we dined, it was thrilling to visit the kitchen and to meet Executive Chef Spencer Crawford. He updates his menu often, always highlighting produce from Robert’s culinary gardens and always prepared with wine in mind. We food-chatted a little about his love and admiration for Italian cuisine, his mother and grandmother’s home cooking. He fondly recalled how dinner was prepared and served almost every night at home, and only on special occasions did they dine out. He affectionately shared, “That concept is kind of lost now. 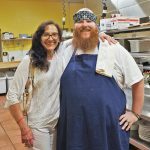 People eat out all the time, and now eating at home is the special occasion.” It was incredibly refreshing to see first-hand how he recognizes and appreciates the importance of food, family, and community, and how he demonstrates this in the food he crafts. There are many emotional connections to draw from when creating dishes from the bounty of a particular region. The culinary harmony enjoyed between Robert, Luca, and Spencer is indisputable as each brings a personal and unique interpretation to not only the menu, but to the entire estate. About Barboursville Ruins: The mansion was originally built for the Commonwealth’s 18th governor, James Barbour, whose architect was none other than Thomas Jefferson. The Founding Father, whose obsession with wine has created the foundation upon which so many Virginia wineries now stand, was renowned for his belief in Virginia’s wine-growing potential, praising the area as having “every soil, aspect, and climate of the best wine countries.” The magnificent mansion Jefferson designed was destroyed in an 1884 fire (its ruins are a regional landmark listed on the National Register of Historic Places and are still visible on the estate today), but Jefferson’s passion for viticulture and agriculture live on in Barboursville’s commitment to the local and historical spirit. On a recent trip to this viticultural masterpiece, I became more aware of the vitality of the land, and how it intrinsically connects us to ourselves, our history, our soil, and our culture—to our past and to the present. More so, fundamental provisions such as food and wine have profound energetic effects on the body, mind, and spirit. I discovered an evolution of art that remains present at Barboursville. Barboursville Vineyards is preserved in such a humbling manner so as to offer a modern experience while staying true to its notable historical character. This is an accomplishment that only few can manifest. The entire estate offers a peaceful oasis, a place where one instantly becomes unhurried, and yet one’s mind is at full attendance. Thomas Jefferson’s belief and dream of our area one day becoming a premier wine destination has come true in the robust terroir of Virginia’s Piedmont, most notably at Barboursville. The conversation, the casual familiarity with someone you’ve never met before, and excellent food and wine were the hallmarks of dining with Jefferson. In a surreal way, we found ourselves wondering if we possibly had indeed dined with the Founding Father. In land, food, and wine, there is truth. With this visit I leave in great admiration. 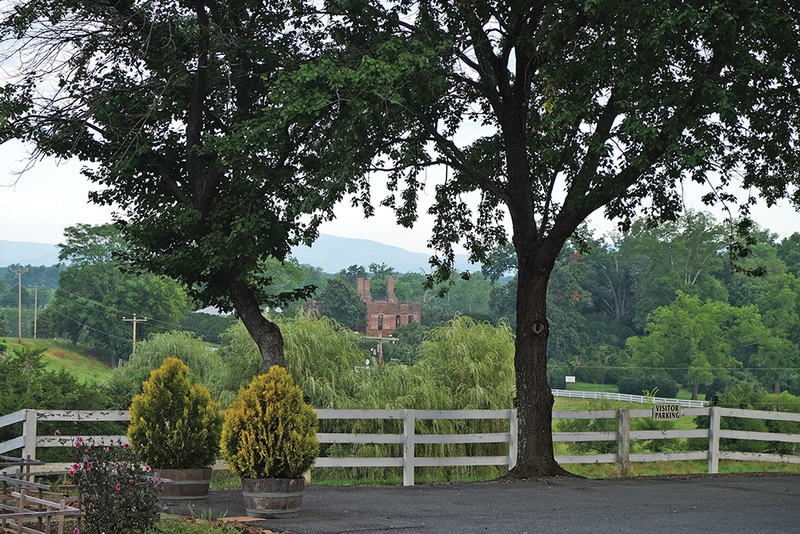 Octagon, Barboursville’s flagship wine, is the most celebrated red wine of Virginia. Taste it and you’ll never doubt its pedigree. If you’ve never experienced a vertical wine tasting before, this is the time, the place, and the wine to step up and sample. It’s a tasting of the same wine but from different vintages, considered a rare opportunity to delve into valuable, older wines. The vertical wine tasting is held in the vineyard’s exquisitely stylish tasting room, Library 1821, where you’ll discover all of the wines are creative, interesting, and exciting. It’s a fantastic way to experience Octagon’s uniqueness and evolution from each harvest. It can also enhance your understanding of the many factors that play subtle roles in shaping the components of a single wine. Check Barboursville’s calendar for upcoming events and tastings.